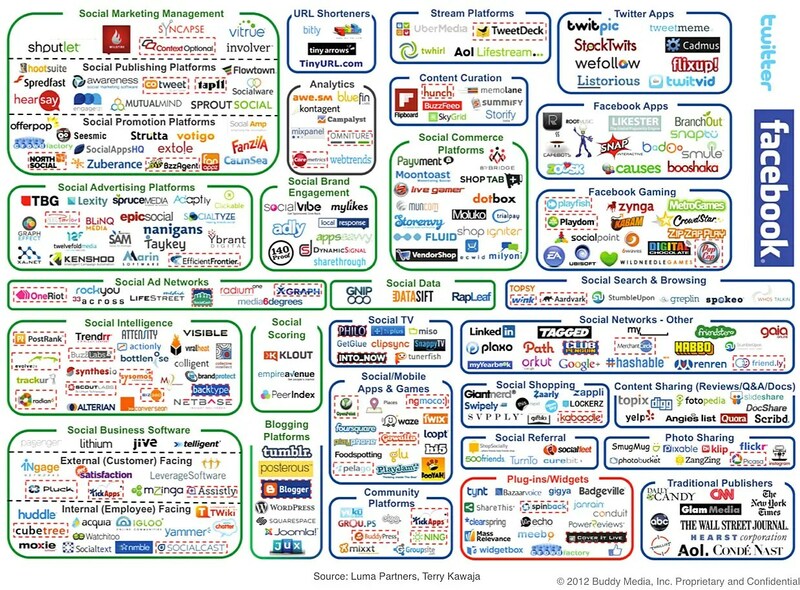 Have you read that post by BusinessInsider about how ridicously complicated social marketing has become? As a marketing (including social) person I have to admit they were not that far from the truth. Also, I keep asking myself how is that possible to recover from the crisis till all these new tools come up and involve millions of people, usually during their working hours. But that’s another story… I will soon do some new analysis on the GDP/Social Network trend relations to update the one I did last year. I know, it’s been a while since I last posted on this blog. To be precise since when I started my new job. May you guess I am quite busy with that? In the meantime, a few things have changed with the main social networks out there (Facebook, Twitter and LinkedIn) and other that the inspiring and scary image by business insider, maybe it’s good to do a quick recap. – Social networking sites now reach 82 percent of the world’s online population, representing 1.2 billion users around the world. – LinkedIn has launched a new app – which unfortunately lets you add people too easily, regardless of their networking request settings. Note to the reader: LinkedIn is NOT a Pinterest for CVs. Connet to those you want to network with. – Instagram has been purchased by Facebook, that recently published its Facebook Photos app – not sure where’s the point here. Maybe they bought Instagram to avoid such a huge competitor? And was that really worth 1B$? Personally I like Instagram and I use it a lot, though mainly to adjust images that then I upload on Facebook. I also have my own fancy URL on follogram, I’d suggest you do this – it’s the easiest way to show all your insaphotos in a pinterest style, so to say. – 3 big news in FB’s founder life: he got married to his girlfriend since almost ever, and she got her PhD a few days before. In the same week, the Facebook IPO got the attention of the media. Many criticize the IPO, many hope Zuck will fail. Have they done so much in any of their past weeks? And the greatest part of it is you don’t need to fill that annoying forms to register to it. If you have either a Facebook account or a twitter account, all you need is a single click – is that easy. You can follow your interests on this virtual pinboard and follow others’ pinboards. You can either pin from a website, or upload your own photos or “repin” others’ pins. Pinterest is fully integrated with Facebook and Twitter and it lets you share on more platforms at once. What is really interesting about Pinterest, is that it’s a great inbound marketing help. In fact, all links go back to the pages where you spotted that specific picture, including your own company website or eCommerce store – that’s maybe why retailers like it so much and why it’s actually driving a lot of traffic to the US (and some UK based retailers). There is a small limit though: for some reason it does not get the € (euro) symbol, and you can only attach prices (do you really need to?) with a dollar or pound symbol. That’s quite common though – unfortunately though the web is open to everyone, too many US based projects tend to forget about the rest of the world. Which Social Networks do you currently use? I’d love to hear from you about both your personal and business use of all these social media tools, apps and platforms. Are they effective? Who manages them in your organizations?